Supported formats and algorithms are listed here. Release 8.0.0 is now available. All deprecated methods, classes and files are removed and all-min.js file get smaller size. Release 7.2.0 is now available. Major refactoring before major release update. Making Many long name methods deprecated and new short name methods are provided to reducing file size. NOTICE: Some people complains that 'jsrsasign' is too huge to use in the web sites. The 'jsrsasign' is 'swiss army knife' style crypto library which has a lot of functionality some users may think not necessary. So I'm planning to remove all of deprecated codes in the next major release 3 month later (may be 8.0.0 in July) to to shrink size. Until then please use subset package. Thanks. Release 6.2.0 is now available. Cipher class added. Release 6.1.0 is now available. RFC 6960 OCSP protocol support added. Release 6.0.0 is now available. Now "jsrsasign" become "fs" safe so that it will be available for CommonJS or Webpack. 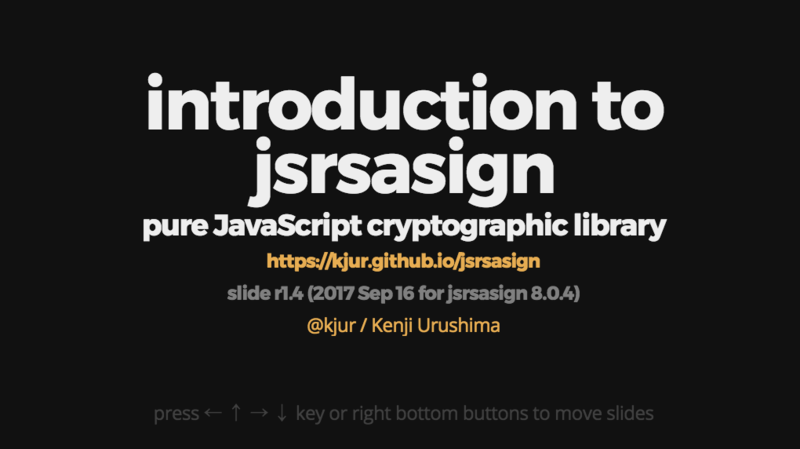 Slides for jsrsasign introduction is available. Release 5.0.6 is now available. Now jsrsasign can be used in strict mode (--use_strict) of Node.JS. Release 5.0.4 is now available. There is no library and npm update but sample Node scripts are added. Especially I hope jwtverify tool is very useful for JOSE guys :). Release 5.0.2 is now available. RFC 7638 JWK thumbprint supported. Some file read/save functions added for Node.js in nodeutil.js. Alternatively, you can download a zip file for the latest development version or a previous releases. You can see the list of QUnit unit tests here and I hope they help you understand 'jsrsasign' library and APIs. Copyright © 2010-2016 Kenji Urushima. All rights reserved.